The Shah's are pioneers of India's first website which is dedicated exclusively to homoeopathy, classicalhomoeopathy.com. 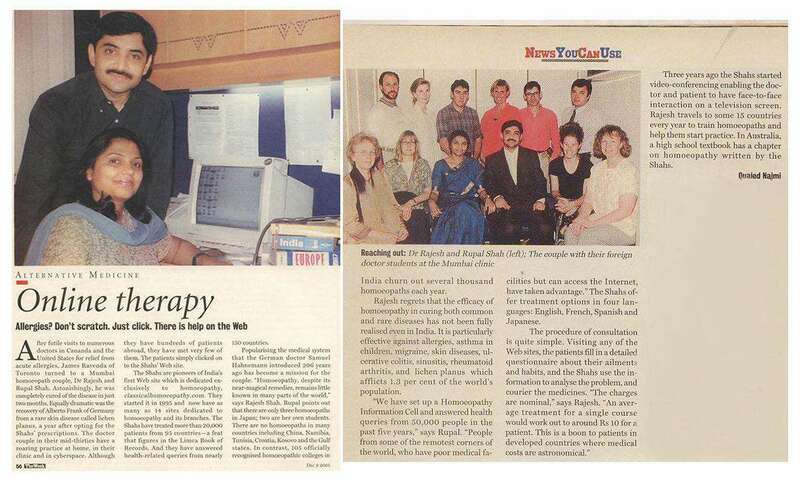 They started it in 1995 and now have as many as 14 sites dedicated to homoeopathy and its branches. The Shahs have treated more than 20,000 patients from 95 countries - a feat that figures in the Limca Book of Records. And they have answered health-related queries from nearly 150 countries. Popularizing the medical system that the German doctor Samuel Hahnemann introduced 206 years ago has become a mission for the couple. "Homoeopathy, despite its near-magical remedies, remains little known in many parts of the world," says Rajesh Shah. Rupal points out that there are only three homeopaths in Japan; two are her own students. There are no homoeopaths in many countries including China, Namibia, Tunisia, Croatia, Kosovo ant the Gulf States. In contrast, 105 officially recognized homoeopathic colleges in India churn out several thousand homoeopaths each year. Rajesh regrets that the efficacy of homoeopathy in curing both common and rare diseases has not been fully realized even in India. It is particularly effective against allergies, asthma in children, migraine, skin diseases, ulcerative colitis, sinusitis, rheumatoid arthritis, and lichen planus which afflicts 1.3 per cent of the world's population. "We have set up a Homoeopathy information Cell and answered health queries from 50,000 people in the past five years,' says Rupal. "People from some of the remotest corners of the world, who have poor medical facilities, but can access the Internet have taken advantage.The Shahs offer treatment options in four languages: English, French, Spanish and Japanese. The procedure of consultation is quite simple. Visiting any of the web sites, the patients fill in a detailed questionnaire about their ailments and habits, and the Shahs use the information to analyze the problem, and courier the medicines. "The charges are nominal," says Rajesh. "An average treatment for a single course would work out to around Rs 10 for a patient. This is a boon to patients in developed countries where medical costs are astronomical." There years ago the Shahs stared video-conferencing enabling the doctor and patients to have face-to-face interaction on a television screen.Rajesh travels to some 15 countries every year to train homoeopaths and help them start practice. In Australia, a high school textbook has a chapter on homoeopathy written by the Shahs.